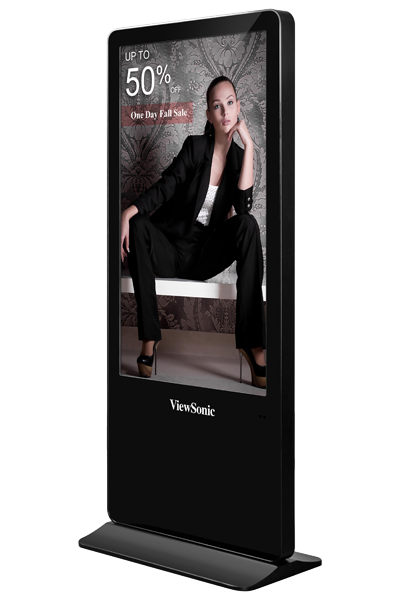 The ViewSonic® EP5520 is a 55” all-in-one free-standing digital ePoster kiosk with a sleek, slim design. Great for grabbing attention in busy, high-traffic areas, the EP5520 comes with a scratch-proof tempered glass faceplate for added durability. Featuring Full HD 1080p resolution, 176°/176° wide-angle viewing, 400-nit brightness, 4,000:1 contrast ratio, and dual 10W stereo speakers, the EP5520 delivers customized multimedia messaging with vivid clarity. Photo and video files can be played back using the embedded Quad-core media player and 16GB of internal memory, or add your own media player using the convenient media player cradle inside the lockable security door.